(Yes, I’m aware that capital letters = shouting, but that’s how excited I am! I want you to hear an announcer’s voice at the NBA Finals with the crowd cheering and pom-poms waving—they still use those, right?—and really big dudes running out in shiny jerseys. Never mind. Scratch the big dudes). Because I’m finally delivering on the master closet reveal that I’ve hinted at a few times over the last week or so, and it’s big. I’ve always wanted a pretty closet (sometimes I wish I could add a line-per-line soundtrack to my posts; if I could, you’d hear violins playing a haunting, nostalgic score right now). But when we moved into our house (95% of which we built ourselves), the closet was pretty much the last thing on a looooooong (add about 4,567 more “o’s” and you’ll have a better idea of how not a priority it was) list of projects. So, in went the clothes, the shoes, the jewelry, the hair doodads, the suitcases (? ), the leftover home décor (?? ), the…scuba-gear (??!). Yeah. Our closet was pretty much a dumping ground for anything we couldn’t find a place for somewhere else in the house. And it was anything but pretty. But enough of my jabbering. Let’s let the pictures do the talking, shall we? Okay, obviously not the world’s worst closet. I mean, I have a built-in shoe shelf (c/o my amazing husband) for crying out loud. But there was just too much stuff in too little space…space which was not being utilized to its highest (or even middling) potential. All the “extras” that had trickled into the closet over the past two years, only to be shoved under the clothes racks. $5 garage sale “chandy.” It more or less got the job done (i.e. I usually came out of the closet with two matching shoes). A view of the opposite side. Again, the bones are good. My husband made built-in cubbies, a laundry chute, and shelves…that got swallowed whole by my expansive scarf collection. Also, “non-cute” books and all my old issues of Fitness and Martha, were just jammed, willy-nilly into whichever space would fit. Pretty much everything out. Aaaaah…it already feels so much better, but a closet’s not much of a closet unless it’s actually closeting stuff…right? (You’re nodding your head, but you look confused). But before we could put it all back in, we had a few teensy changes to make. The first order of business was to add a little color to the space. If you’ve seen my DIY Tufted Ottoman tutorial (which gave you a quick glimpse of our living room), Della’s red and aqua nursery, any of my Wardrobe Wednesday posts, or my new 100% thrifted fashion site, Second Hand or Bare Bottom (oh yes, I did), you’ve probably been able to gather that color and me…we’re likethis. So white walls—even in the closet—were not okay. I knew I wanted to use some paint samples I had left over from our living room redo, so I intentionally bought a too-dark blue-green shade from Lowe’s called Blue Shamrock intending to lighten it up. Then I opened it and got totally fooled by how light it was in the can (I’m not a paint amateur, I promise. I know it dries darker, but this was really light) and ended up cutting in the closet 3 times because my color kept ending up too dark. Boy, those were good times. Apparently, flexed toes are essential to effective decoupaging! Is anyone else hearing the Hallelujah Chorus right now? (Okay, officially on the to-do list: make blog soundtrack). For the scrolling-averse, I’ve compiled a collage of my favorite little vignettes (but I do hope you’ll scroll too…your finger probably needs the exercise). I hope you’re ready for pictures, pictures, and more pictures, folks, because I am beyond happy with the “after,” and Momma wants to show off her new baby! Believe it or not, that’s the same $5 chandy from the pic before, just reversed so that the lights point upward. Oh yeah. And painted Sherwin William’s Quite Coral with new Tiffany shades (that I had stashed from a different chandelier that I…oh, never mind…my point is I already had them). If I had really wanted to impress you, I would have ironed a couple of those blouses. Oh well. We took the single pole that was on this wall and pushed it up to the ceiling, adding another pole below to maximize the space. Shaun’s clothes are on the top pole since he can reach without a step-stool. Man, I love tall husbands. I love this “bird verse” print from Jones Design Company! It reads: “Seek first His kingdom and His righteousness, and all these things will be given to you as well,” Matthew 6:33. Above the mirror was really the best/only place for it, but I’m really happy that it’s perched there reminding me every time I analyze my reflection that God wants my first order of business to be, not my outward appearance, but my inner holiness. Hats and scarves are bundled away in those cute jute baskets that I got at Hobby Lobby for 50% off. Isn’t it nice when your shoes just happen to match your baskets? (I promise I didn’t buy those just for this picture). Now, that’s a shoe shelf. I bought white paintable, textured wallpaper at Sherwin Williams ($6.99 for singles rolls, but, of course, as with all wallpaper, it only come in doubles…why do they do that? I could write an entire rant post about that very topic—and I just might some day) then painted it Quite Coral and gave it a metallic craft paint glaze to highlight the detailing in the texture. I’m not sure if that lamp (GW, $3, with a Target shade) will stay, but for now, it brightens up the space nicely. More hooks now hold my necklaces, which act as wall-art all up and down the sides of the shoe shelf. If I were worth my decorating salt, I would have stuffed all my bags with paper to make them stand at attention, but a) my taxidermist skills are sketchy at best, b) I’m a real girl with a real house who is too lazy to pull paper out of her bags every time she uses them, and c) I can cram more bags up there this way, and more bags = happiness. Raise your hand if you love organization…especially in shades of aqua and white. Since we moved so many of our things up, that little teal step-stool from Marshall’s ($10) comes in very handy. Perfectly patterned aqua and white condiment bowls from Marshall’s make for wonderful accessory holders. Really, who doesn’t need a fat, white ceramic pig in her life? I found each of the animal figurines (which are actually piggy banks) at the Dollar Store for $1 each (that may sound repetitive, but not everything at the Dollar Store is actually one dollar…sneaky). I was so thrilled to find something so beautiful and functional (clear plastic tops so I can see everything!) that already had something I wanted inside (I’m going to hang the rest of the tea-light holders from our pergola outside). And at $4.99 per box of holders (from Ross), it was a steal (especially when you consider that all the other pretty storage boxes I found were $5 all by their lonesome). I found this little girl at Goodwill for $5, cleaned her up, decoupaged her with (Christmas!) wrapping paper, and changed out the knobs for my favorite white flower versions from Hobby Lobby (50% off, of course). It houses bigger bags like backpacks and totes. I got the vintage suitcase at Goodwill for $2. I bought this jewelry tree from Marshall’s a while back and found that magenta basket @ Goodwill for fiddy cent. Fuchsia velvet hangers are definitely a girl’s friend. I think my favorite element of the entire closet is the “Mr. and Mrs.” poles. I ran across this wrapping paper in the wedding section at Walmart and knew it was just the thing to spruce up plain, white poles. A little Elmer’s glue/water concoction and a sponge brush were all it took to create closet pole magic! Honestly, magical might be the best word to describe how it feels when I walk into my very own dream closet. It is humble, certainly, by fancy-house standards, but it is perfect for me, and I couldn’t be more thrilled (unless maybe I could have closed my eyes, clapped my hands, and then opened my eyes to discover it all done for me…hmmm…yeah, not so much). I haven’t done an official tally, but I guestimate the entire transformation to be at around $150 (including the dress form). Not too bad considering the drastic change. I hope you’ve enjoyed viewing my closet as much as I enjoy having it (I think I get the better end of that deal). Me? I think I’m going to round up the kiddos and just go sit on the floor in—you guessed it—the closet. If you have any questions, or I’ve left something out that you’re interested to know, don’t hesitate to email me or leave me a comment! I love hearing from you! Oh and the orange rug pictured…love that too. Can you tell the source? Love! Can you tell the wall color in this closet? Very happy new follower! What fab ideas. We’re in the midst of a very messy build and this is wonderful inspiration. aaahh Love it!!! your genius! Love the poles too! OMG, I love it! I can’t wait for my closet makeover in our soon-to-be new house! And I don’t have to share it with hubby! This is the greatest ever!! I found your blog through your DIY tufted ottoman post (which is the inspiration of the tufted ottoman I am currently working on as a birthday present to myself and started browsing through some of your other posts. The picture of you painting with your baby girl is what is making me a permanent fan! I have two young children as well and sometimes get so frustrated at the challenge it is to get anything done….but, slow and steady wins the race, right? I can’t count the number of times I’ve had to paint or drill or do EVERYTHING with a baby in my arms, haha. I’ll definitely be following your blog and wanted to let you know how cool you are! Great job on the closet. Sad to say but your “before” picture looks like my “after”. I think it’s great that you had a Saturday yard sale & donated money as well. BTW, where do I look to find out what – if anything – is left? Yup! I can do that Rachel! Amazing closet and so pretty with great organization. I love all the little details…a great job and great pictures. I do not know which part is my favorite..it is like a mini boutique! I am a new follower. Just saw your guest post and wanted to say hi! I’m following you now too. Keep up the inspiring work! WOW! That is an amazing closet! I love the Mr&Mrs paper pole dealio! Very cute!! That looks fabulous! Just wanted to let you know that I’m featuring it on my “Top 10 Organized Spaces” post! Feel free to drop by and grab a button that shows that you were featured! Ah-mazing! I’m going to be tackling my own closet beginning today. And, I have to admit I am a bit scared. This post is something akin to watching those 30 second DIY spots on tvs. You know, the ones that have you convinced of your being capable of managing ANY project on your own after watching their half-minute How-To (Anyone want to lay pavers, hang/mud drywall, add a bathroom? I know how after a short 30 second tutorial!)? Your “After” makes it look like you now have more space than you need. I’m REALLY hoping for that same effect when I’m all done. Fingers crossed! Love the redo! As for the lamp? Fuchsia spray paint! Great job on this one! Love it! I love this and one of my goals is to redo my closet, so I am inspired. I would love to feature you on my blog and ask you to be a guest judge sometime. Come on by and let me know if you are interested. Email me if you are. Also, I am always looking for people to do guest tutorials. This looks amazing, I love it (and am totally jealous!) I can’t believe you were able to do all that for $150. Great job! I love your style and your site! Really all picture closet nice! I sew many look of design form this sites. I’ve been designing closets for 20 years and own a custom closet company. Your closet is a prime example of why closet design should be left to professional closet designers who pay attention to maximizing space, ergonomics, visibility and accessibility. Your closet may be “cute”, but is certainly not efficient or necessarily functional. Wow! I want to go empty our new closet! Thanks for sharing. Wow Wonderful! You are making me look at my closet diffrently. WOW! I’m pretty sure I would be feeling like someone did magic if my closet looked like this! My closet is the most abused space in my home. It is a walk in closet but I dare say that I have too much stuff on the floor that I can’t even walk in it. UGH! I am so impressed to see the photo of you painting holding the baby! You are a real trooper! I hope it still looks just as beautiful and you are enjoying being able to find everything quickly…sigh…sounds heavenly! I’m glad you linked this post up to Roomspiration! I have really enjoyed all the posts you have linked up and am a true follower now. Thanks a million! Wow! I could live in there! So many pretty touches and organization! Love it. Hope you’re enjoying it too! Wow! You did an awesome job with this space! I think my favorite part is the Mr & Mrs wrapping paper poles as well. Although it’s all so fabulous, I really love it all. Thanks for linking up for Roomspiration and for the html for the GFC button. My hubby is a programmer as well which I love because that means he’s tech support for my blog. I’m following and going to check out some more of your great posts. I love your closet, great job! Wow!! What a wonderful job you’ve done. This is amazing! I love the bird print too! Great job girl. I would have never dared to so that esp with kids around. You are brave and laborious. The closet looks wonderful. I Love it, the chandalier is so colorful! Great Job very rewarding. A smile everyday ! I would love to copy your chandelier! If I could accomplish something half as beautiful I would be ecstatic. Oh what an inspiration. My closet has been on my to do list for 6months now. Since I am in back to school mode, aka cleaning boys rooms I might as well get mine done too. Love love love the wrapping paper pole, just the perfect touch. Wooow! I am impressive with your new closet, simply perfect! I need it! Oh most definitely and the closet looks organized and fantastic! Well, I’m sure glad you stumbled up on my blog as well! And believe me, decoupaging takes less than zero talent. I’m not exaggerating when I say that it is the easiest, least time intensive, most forgiving furniture treatment EVER. You could do it, I promise! So glad I stumbled upon your blog – you are so talented! I would never attempt decupaugeeueee however you spell it, let alone perform the miracle that it is My closet looks identical to your first before pic – no built in or laundry shoot in the other end – wow – I really need to get to work in there! Whew – and then can you come and organize my garage…another sore spot in the house Be blessed! THAT.CLOSET.IS.GORGEOUS!!!! What a beautiful job you did. Love the colors. I am drooling! Thanks, Rhiannon! And yes, it’s a pretty big space, so I had a lot to work with! Oh my goodness! I cannot see enough photos of this! It’s beautiful! And I think it’s a very large wardrobe, though I live in England where ours are ones you buy in a furniture shop! You did an amazing job. Thanks, Cassie! I appreciate the compliments coming from such a talented woman as yourself. It seems like I can’t read a blog post about design without your name popping up! (I loved your repainted/restyled shelves, btw). And I luuuuurve that yellow rosette pillow. I’ve got one too! : http://www.fivedaysfiveways.com/2011/07/diy-tufted-ottoman.html. Thanks, Allison! I grabbed a button. I soo appreciate the feature! Thanks, Emily! It’s made getting dressed so much more enjoyable, lemme tell you! Why, thank you! Me too! Thanks! It was fun to make completely *mine* (well, and his too…but mostly mine : )). I love how color always makes things pop! It’s so so so cute!!!!! and girl you have got some fab shoes! 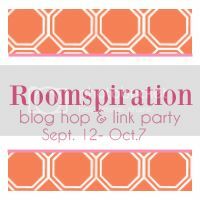 Check out your feature at my weekly Hookin Up with HoH Link Party! I WOULD LOVE TO HAVE A CLOSET LIKE THIS. WOUILD YOU PLEASE COME TO MY HOUSE AND DO MINE? Okay, I’m speechless here…..who would not want that closet? My closet is a huge mess and a third of the size! My favorites are the Goodwill cabinet and suitcase. They’d be perfect for my Club G.W. (Goodwill) Party going on right now! Hope to see you there! Amazing closet!!! I LOVE the new light fixture!!! LOVE IT!!! ooooh lala! love it. I need a closet this big so I can make it exactly like yours. haha, mine’s a little small but I am looking at revamping it a bit and making it look more sheek. love the mr and mrs clothing rods. I sincerely wish that I could redo my closet like yours. Alas, we are renting. Second, I would need a bulldozer to redo mine. Lets just say mine has been a work in progress for some time. Thanks for the cute ideas. I seriously need to do this for both of our closets (I hoard the one in our room & my husband gets the spare). I look forward to the day I have a closet this huge/adorable! 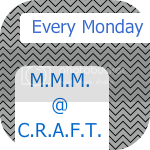 You should link this up to my Green of the Week blog party, some re-purposed things in there! Love the pop of color in the shoe racks! Great Job! Wow! This is an amazing makeover! It looks like a little boutique in there! Gorgeous! Happy to give you hope, Tabatha! And yes, things can get done with kids running around (or napping)…just not very fast. And believe me, once you catch up on sleep, you can get plenty done with just one baby b/c all they do is sleep, eat, and poop! ; ) So nice! This closet makeover makes me so happy! It greatly appeals to that pregnant nesting instinct that I’ve had to starve basically the whole month of July (and it looks like August) due to being so busy and out-of-town… At least there’s hope, it appears things CAN get done after kids come along! And I’ll only be starting with one (kid), so there’s definitely hope. Good job! Thanks, Jane! Building is messy, isn’t it?! Whew! I visited and followed back. Thanks for coming over! A-mazing! No words, oh wait, how about JEALOUS? You did a great job. NO detail was forgotten, You rock!! Thanks, Crystal! I have to admit…I AM happy to call this closet mine! : ) I seriously am SOOOOO blessed to have such a nice closet to work with and a hubby who listens to me and builds me things. Thanks Rhonda! They were only 50 cents a piece (or less) from Ross/Marshall’s. Over all, it was my biggest expense in the closet makeover, but they make such a big impact that it was worth it to me! How incredible GORGEOUS!!! !……….I’m SO jealous!! Thanks so much for linking up! I featured your post in my wrap up http://tidymom.net/2011/great-ideas-by-you/ Have a FABULOUS weekend! Visiting here from Miss Mommy….and had to say that your closet makeover is FAB!!! Awesome job!! Especially w/ a little one on your hip….haha! Oh.my. I think I may be in LOVE!!! This is totally awesome! I LOVE the colors and would be so happy to call this closet mine!! ummmm what?! Wow!! great great job! My closet is approx. 7×14, Pinky! Go get it, girl! Thanks! And yes, it would definitely not have been as much fun/cool to redo a very small closet (especially one in which my hubby’s clothes took up most of the space..boooo! : )). Thanks, Cathy! I loved getting creative in here. No limitations when it’s the closet, right? This looks fanastic. I badly need to sort out my wardrobe. Thanks for the inspiration! Fabulous! So many creative ideas here that my head is spinning! Visiting from Miss Mustard Seed and also love your nursery! Very fresh and unique. I’d love for you to visit and share this at my link party… AWESOME JOB! Love it! Love it! Love it! Although, now I am feeling a tad bit of envy as my closet is extremely small and my hubby (I love him dearly) has atleast 2x the clothes I do. Not to mention it’s one of those that you can only see 1/2 of the closet anyhow. One day, one day I’ll get to do a redo of my own….in another closet! Why, thanks, Christy! It was a lot of work but worth it in the end! I am sooo jealous! What an awesome closet! I need to do some major work on mine! Beautiful, just beautiful! Thanks! I love it too! : ) And, yes, I’m incredibly blessed to have started out with a nice big space to work with! Thanks, Aimee! And yes, sometimes doing things WHILE holding small children is the only way they get done. Thanks, Stephanie! Details and color are seriously my MO. I always admire it when people rock the neutrals and simplicity, but it’s not in my genes, I guess. Thanks! I got it at Ross! I love your closet! Where did you get the dress form? I really like this transformation! You used lots of detail and color to make it pop! I never would have thought to cover the rod with paper! I love your chandie, too! Wow! You did a wonderful job! Your closet looks AMAZING!! There’s just nothing like an organized closet to make you go “aaaahhh!”. I had to smile when I saw the picture of you holding your little girl while you were painting. I do that all the time too!! You gotta do what you gotta do sometimes! I LOVE your new closet!! I’d settle for your old one right now, but LOVE the new one!! Great colors and organization. Think I want to rush home and reorganize my closet now! LOVE LOVE LOVE it!! I wish my closet was as big as yours. I can not believe it only took you $150 to fix it up. I love all the color choices. Great Job!! Thanks! I like it too! It looks just amazing I so wish I had half the closet to do this with mine. Awesome! Great work. I really love that dress form. WOW, girl! Your closet looks amazing! You did an awesome job with it! I love the colors! Now I wanna go do something to mine haha! – I can’t believe I never thought of painting the closet! Fun! Thanks, Erin! It was a lot of work but really very worth it! I love it! And I would love to design spaces like this for other people as well. It makes me quite happy!